The ACT is the leading U.S. college admissions test measuring what a student learns in high school to determine their academic readiness for college. The test has English, math, reading and science portions, each of which are scored on a scale of 1-36. 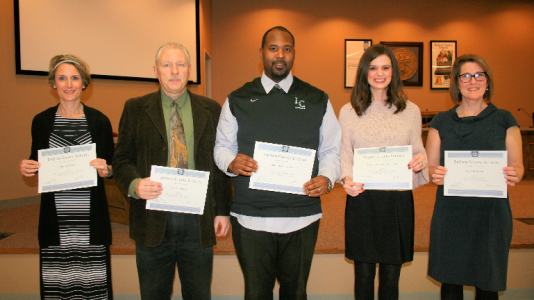 Three DeSoto County School District students have scored the top possible composite score of 36 on the ACT test. 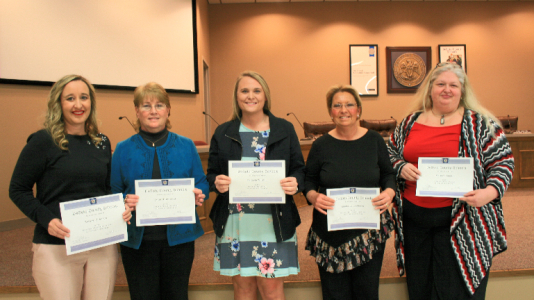 John Barch, an 11th grade student at DeSoto Central High, Sydney Boone, an 11th grade student at Lewisburg High, and Bailey Terrell, an 11th grade student at Hernando High, achieved the top score. John, the son of Gary and Mary Barch, is known for his humility. He learned about his perfect score in December, but only told his family and a few friends. He took the ACT three times, once in the 7th grade with the Duke Talent Program, earlier this school year (earned a 34), and in December (earned a 36). Why did he take it again when he had a 34? 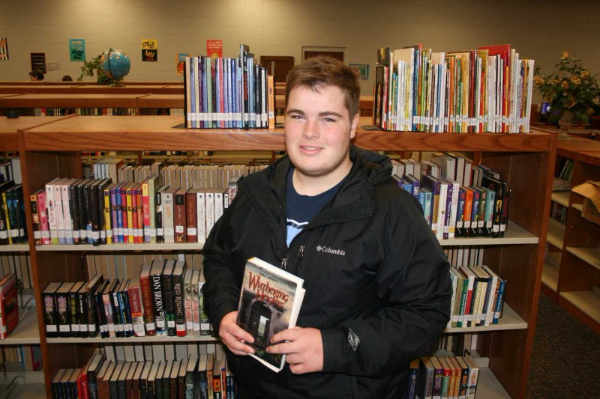 John has attended DeSoto County Schools since kindergarten and has maintained a straight “A” average in every subject. His mother teaches at Pleasant Hill Elementary. He plays on DeSoto Central’s defensive line in football and his favorite pastime is fishing for crappie with his dad and granddad. John plans to attend the University of Mississippi and major in mechanical engineering. Sydney, the daughter of Danny and Erinn Boone, took the ACT two times, the first time scoring 35. She said math was the most challenging part of the test for her. She knew she had to eliminate simple mistakes and pace herself to complete 30 problems in 30 minutes. The easiest part of the exam, she says, was the Reading/English section because Language Arts comes naturally for her. She credits her mom, a third grade teacher at Lewisburg Elementary, for nurturing her love of books. “My mother says I could read at an early age, but I think she read to me so much that I had the books memorized. Books have developed me as a person. One day I would like to become an author to write books of my own,” she said. She is undecided where she wants to attend college, but is applying to a number of schools, including Stanford University in California. Bailey, the son of Don and Julie Terrell, stayed up on December 21st until midnight to see the results of the test posted. He felt confident he was going to beat the 32 he had earned last year, but was not expecting a 36. This was his third time to take the ACT, the first time earning a 24 in the 7th grade through the Duke Talent Contest. When he found out he had a perfect 36, he kept the news to himself until morning since his household was asleep. While he says math is his best subject in school, he felt the math section posed the greatest challenge for him, knowing he had to be error-free. He said the easiest part of the test was the reading section. When Bailey was asked which teachers had the biggest impact on his academic career, he paused, and said, “I had three teachers in the 6th grade at Hernando Middle School who made me like school and inspired me to read.” He also said his parents stressed the importance of academics and pushed him to do well. “My parents spend time with my sister, Noel, and me and play games of strategy,” Bailey said. He is considering Georgia Tech for college since he is interested in becoming a biomedical engineer. Bailey says he likes all sports, particularly basketball, baseball and football, as a fan as well as a player. He is on his school’s Knowledge Bowl Team which won their first round on Channel 3 and competed in their second round at the end of January. He is involved on the HHS Chess Team and the Interact Club. Both Sydney and Bailey have a mutual passion—music. Sydney was in six choirs last year, including CoroRio, and is involved in several this year. 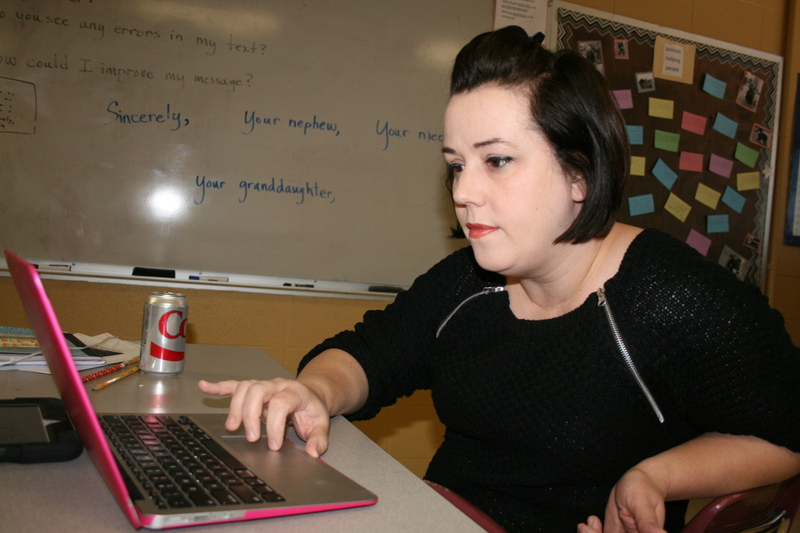 She says her choir director at LHS, Jessica Contreras, does more than educate her musically. “Ms. Contreras is an encourager in everything I do. She has taught me more than music,” she said. 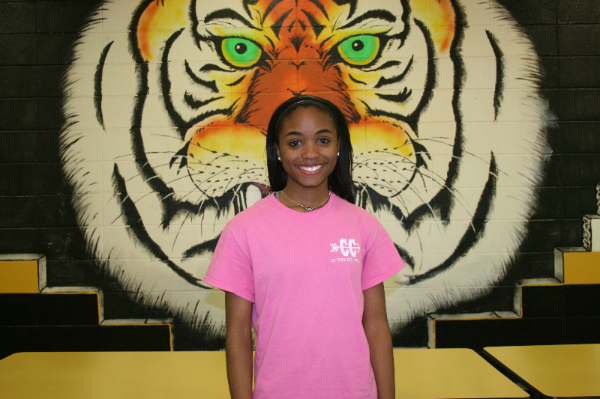 Bailey is involved in Hernando High’s award-winning band program. He plays the snare drum and the drum set. 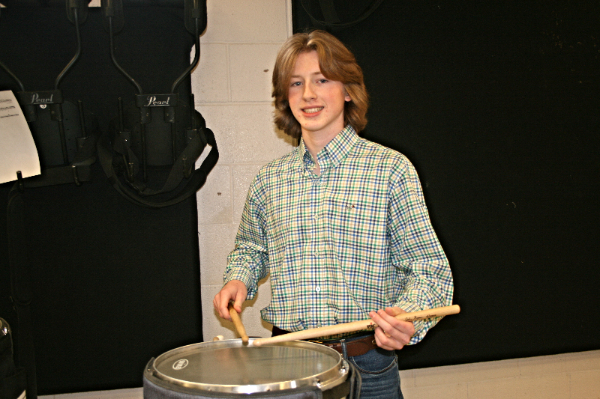 He credits some of his self-discipline and organizational skills to his involvement in band. All three students are products of the PSAT programs which are SAT and ACT test preparation classes. Supt. Cory Uselton told the students they would be recognized before the DCS school board. He pointed out that Addison Green, a senior at Lewisburg High, would also be recognized. Addison earned a perfect ACT score as a junior last year. “These students have ‘Raised the Bar’ for our student body,” Uselton said. 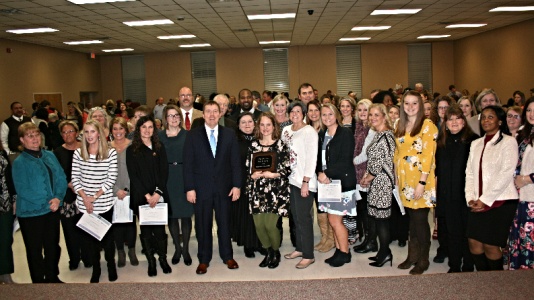 "I am very proud of them and how they represent DeSoto County Schools." Richardson believes kindness and empathy, as well as academic gain, can only come through the growth mindset she fosters in her classroom. 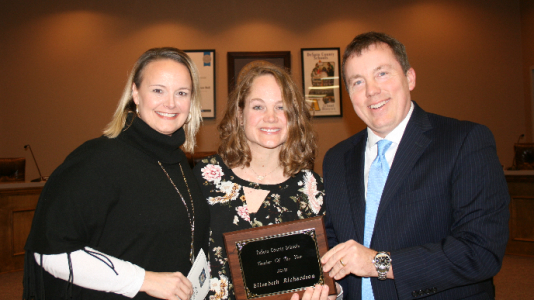 Her small “community of kindness” stands out in DeSoto County Schools and has earned her the distinction of being named the 2017-2018 DCS Teacher of the Year. A former missionary to Togo, West Africa, Richardson said her experiences in the world’s poorest country was life changing for her. Richardson says she can’t compare her Title 1 students with people in Togo. However, she would be remiss if she thought some of her students did not have their own struggles. 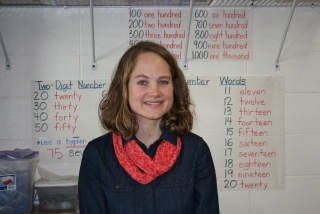 According to Tamara Cumberland, Instructional Coach, Richardson uses engaging, data-driven instruction in every lesson and her test scores reflect this. “By the end of the 2016-17 school year, all but three students were reading on second grade level (M), and those three who were below level were not far behind. 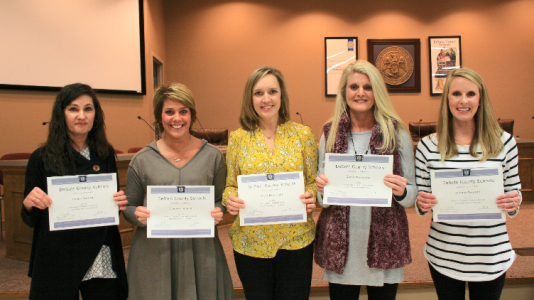 All three were reading at a level K. One of these children showed amazing growth as he had begun the year on a level C (kindergarten level),” Cumberland said. Richardson’s class also had significant gains on the STAR math test. 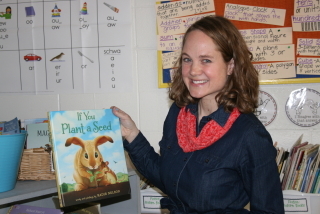 A graduate of Harding University, Richardson has taught preschool for four years and elementary school for five years. She serves as Grade chair (2017-2018). She and her husband, Ryan, have three children. Katelyn Cartwright of Hernando High School was selected by The Gatorade Company as the Mississippi Girls Cross Country Runner of the Year. The award, which recognized not only outstanding athletic excellence, but also high standards of academic achievement and exemplary character on and off the racecourse, distinguishes Cartwright as Mississippi’s best high school girls cross country runner. “You could not ask for her to be more dedicated to her craft,” said Logan Clark, Hernando High’s track and cross country coach. This 11th grade student has a 4.31 GPA. She excels in cross country, track and soccer. The 5’1” junior broke the tape in MHSAA 6A State Championships this past season with a time of 19:29:84, leading the Hernando Tigers to fourth place as a team. Cartwright also captured victories at the Mississippi College Choctaw Open, the “Southern Tee Challenge,” the Saltillo Invitational and the Hickory Flat Invitational, along with a runner-up finish at the Jesse Owens Classic. “I am a strong believer in Christ. I give all the glory to God. When I am running I think about my faith and happy things, constantly visualizing myself crossing the finish line,” she said. A certified soccer referee and gymnastics coach, Cartwright is on the Superintendent’s Youth Leadership Council, and volunteers at Wesley Meadows Retirement Community, the Karm Shelter, Montgomery Village, Backyard Bible Clubs, the Make-A-Wish Foundation and the Knoxville Boys & Girls Club. She is vice president of her school’s student council, and is a member of the Fellowship of Christian Athletes and Hoby Leadership, in addition to serving as a Youth Leader and Choir Director at the McIvor Missionary Baptist Church. Cartwright is now a finalist of the prestigious Gatorade National Girls Cross Country Runner of the Year award. 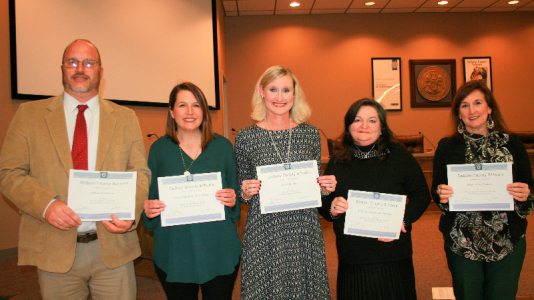 Advanced Placement (AP) teachers from DeSoto County Schools’ eight high schools were honored by the DCS School Board for their work to make DCS become the only Mississippi school district to achieve the AP Honor Roll designation. The nationally recognized honor came from the College Board, a nonprofit organization that connects students to college through programs and services in advanced placement courses. This is the second straight year for this honor, and the third time the district has received this honor. 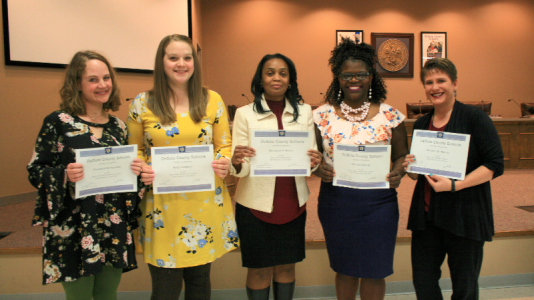 High School Principals introduced their AP teachers and told board members what subjects they teach. 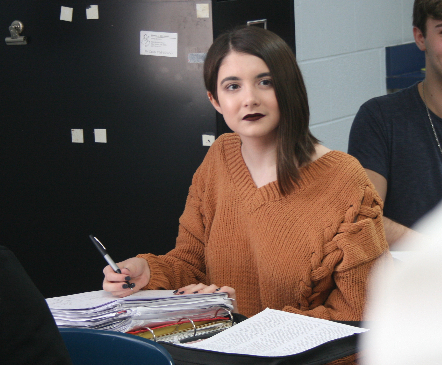 Advanced Placement classes offer an opportunity for students to earn college credit while at the same time earning credit that goes toward their high school diploma. The classes are taught at a college level and at the end of the course, students take an exam and if they earn a passing grade on the exam, they earn college credit. There are 18 different AP courses available in the district. To receive this honor, a district must increase or maintain the number of minority students taking AP exams and also improve or maintain the performance levels at which more than 70 percent of its AP students earn a passing level on their exams. Additionally, DCS had to show at least four percent growth in the number of students taking the courses. 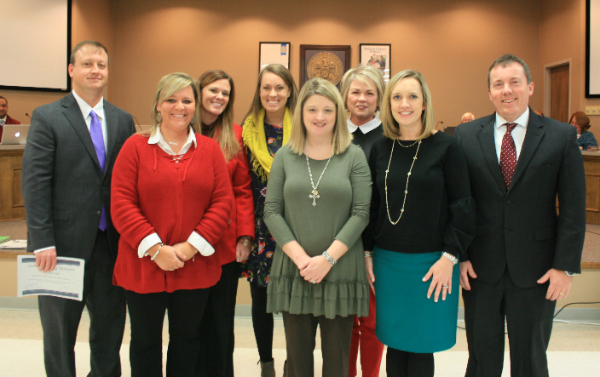 Center Hill High School Principal Doug Payne and AP teachers are pictured with Superintendent Cory Uselton. 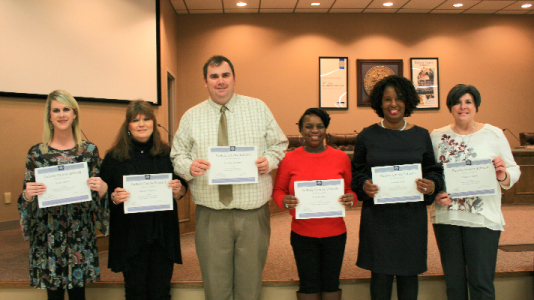 DeSoto Central High School AP teachers are pictured with Principal Cliff Johnston and Superintendent Cory Uselton. 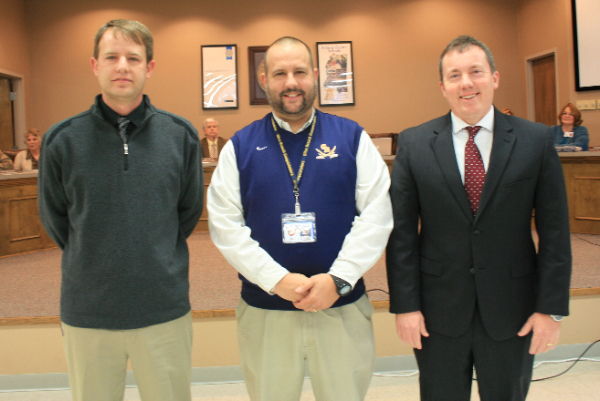 Hernando High School Principal Duane Case is pictured with HHS AP teachers and Superintendent Cory Uselton. 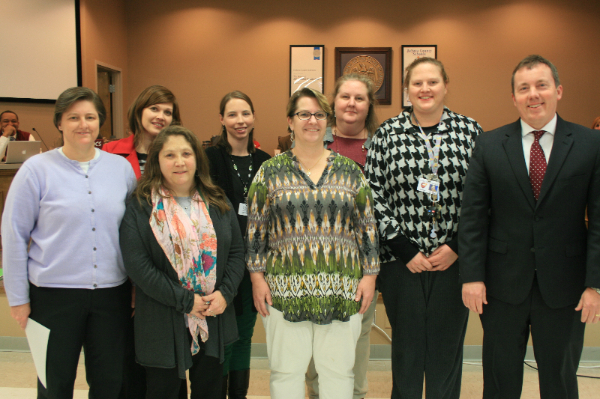 Horn Lake High School AP teachers are pictured with Principal Andy Orr and Superintendent Cory Uselton. 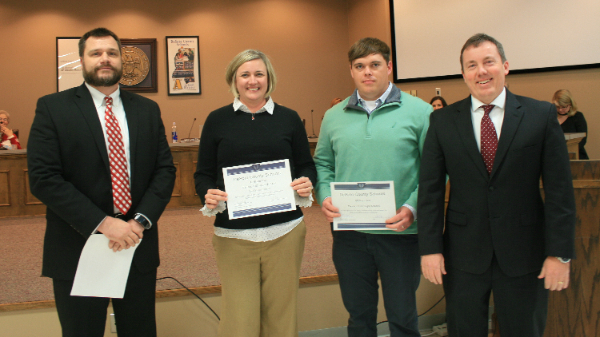 Lake Cormorant High School Principal Rhonda Guice is pictured with LCHS AP teachers and Superintendent Cory Uselton. 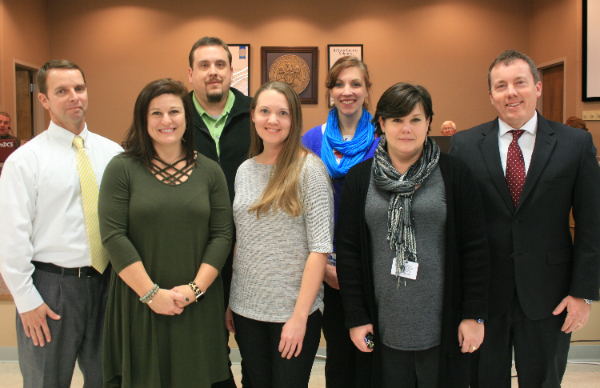 Lewisburg High School AP teachers are pictured with Principal Chris Fleming and Superintendent Cory Uselton. Olive Branch High School Principal Jacob Stripling is pictured with his AP teacher representative and Superintendent Cory Uselton. 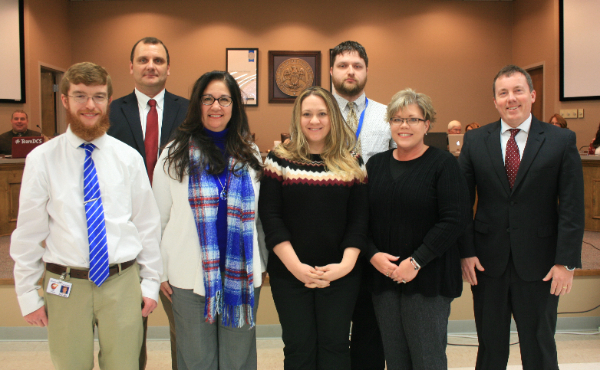 Southaven High School Principal Shane Jones and SHS AP teachers are pictured with Superintendent Cory Uselton. 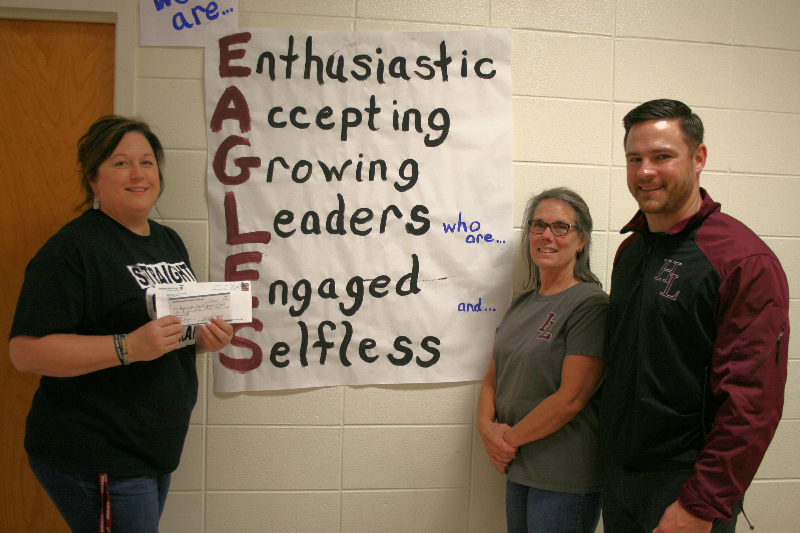 Horn Lake Middle School Testing Coordinator Rebecca Murdock, Technology Teacher Cynthia Smith and Principal Nick Toungett promote the "Eagles" program. Horn Lake Middle school teachers feel the most effective behavior management technique is the easiest to implement..."catching 'em being good." They are implementing this strategy with coupons for their PBIS store, thanks to a $500 grant from Modern Woodman of America. 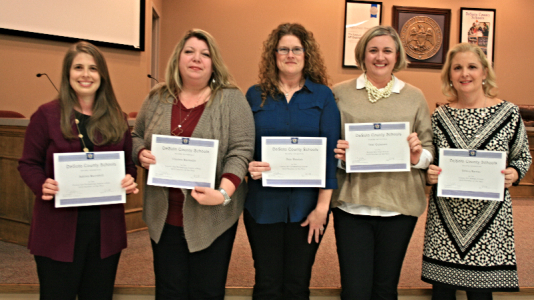 “When students display any of these qualities, they are rewarded with tickets that can be spent in our school store for healthy snacks, school supplies, sitting with a friend at lunch coupon or other things middle school students value,” said Cynthia Smith, technology teacher who applied for the grant. Kroger and other businesses have heard about the program and are donating to the store, according to testing coordinator Rebecca Murdock. 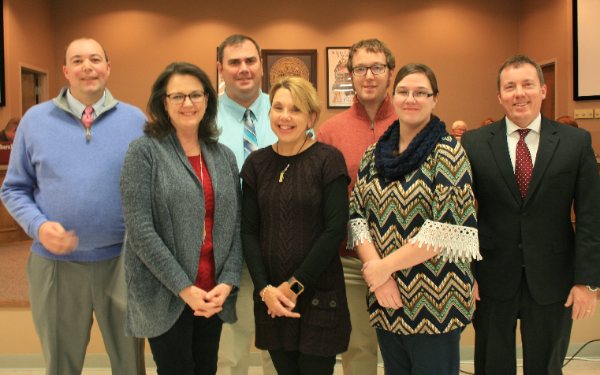 HLMS Principal Nick Toungett said he and his staff talked about setting up this program after hearing Dr. Todd Whitaker at the district’s professional development session at the start of the year. “Dr. Whitaker said it is not what you do when kids misbehave. It is what you do when they behave that can change the culture of your school,” Toungett said. 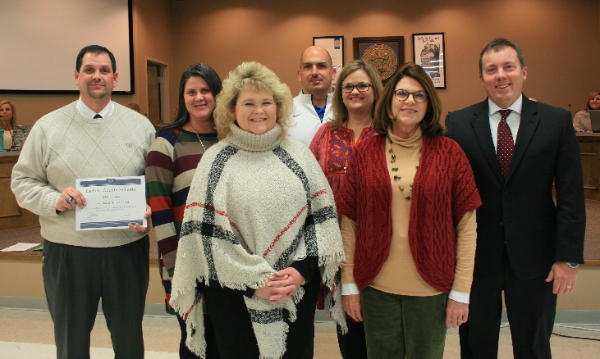 He set up a committee of nine teachers for their Positive Behavior Intervention and Support System. Murdock and Smith both serve on the committee. 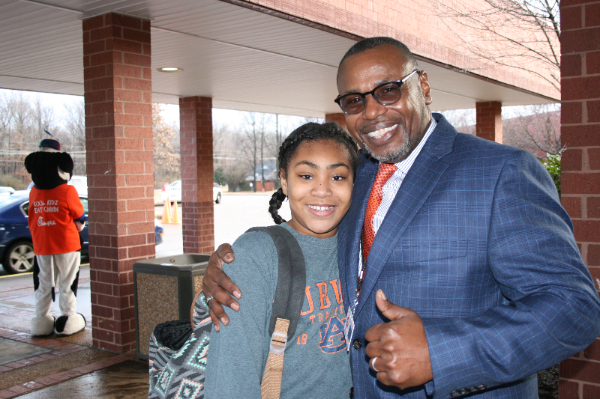 SIS Principal Kenneth McKinney welcomes students to the Great Kindness Challenge Week. 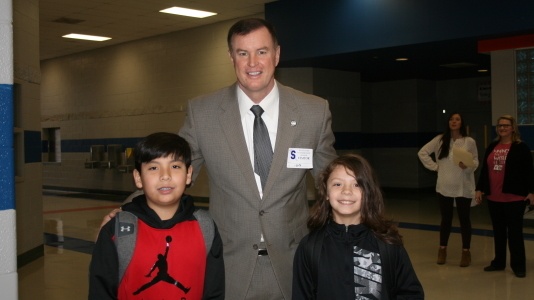 When students returned to Southaven Intermediate School after the week of winter snow and ice, they were greeted by community leaders with encouraging words and high fives as they entered the building. It was all a part of the Great Kindness Challenge, a national program to encourage students to do specific acts of kindness to change the culture and climate of their schools. Waiting curbside was the SIS Principal Kenneth McKinney. As students moved toward their school entrance, they were welcomed by Southaven policemen, fire fighters, Southaven Chamber Executive Director Carmen Kyle, representatives from Brown Missionary Church, Southaven Mayor Darren Musselwhite, DeSoto County Supervisor Mark Gardner, representatives from DeSoto Grace, Librarian Debbie King and other volunteers including the Chick-fil-A cow. “Welcome back,” was a standard greeting. Students looked up at all the smiling faces and stepped a little faster as they heard the song, “Happy” playing in the background. To kick off the week of activities, Foster is issuing challenges such as thanking the cafeteria workers for cooking breakfast and lunch each day, writing thank you notes to staff members telling them why they appreciate them, helping people when they see someone in need, from opening doors to picking up pencils. 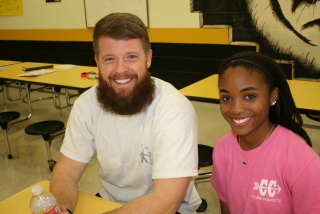 Foster encouraged teachers and staff to send her a note when a student was doing a kind act. She will then recognize students by giving “shout outs” during the morning announcements. Students can also earn “Charger Bucks” to purchase a variety of items or services from their PBIS store. Melissa Dean, a third grade student, has been saving her “Charger Bucks” for some time. 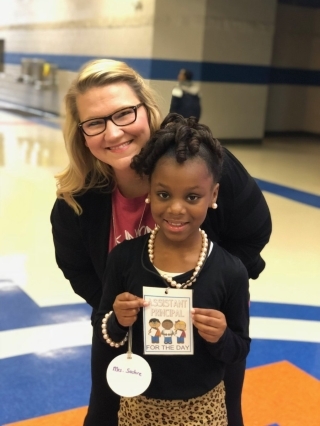 She decided to cash them on the Great Kindness Challenge Day to earn the title of “Assistant Principal for the Day.” She got to dress like Assistant Principal Kristy Dunning (skirt and pearls) and shadow her activities all day. She also got to hold her radio. Has this experience made her want to become an assistant principal? “No, I want to be a second-grade teacher,” she said. EL Instructor Lindsey Morris teaches English as a second language at Lake Cormorant Middle, Center Hill Middle and Horn Lake Middle School. What is the best way to understand a concept? Teachers know the answer: Explain it to someone else. 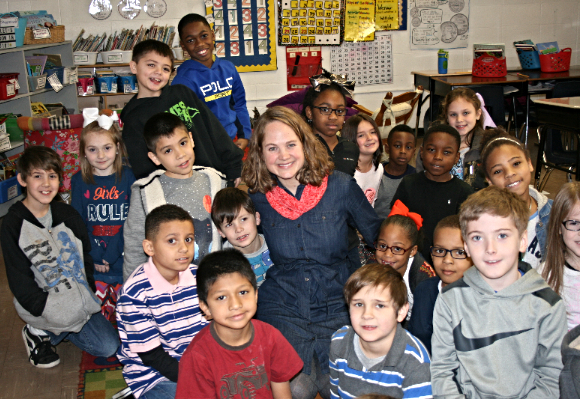 Lindsey Morris teaches English as a second language to students at Lake Cormorant Middle, Center Hill Middle and Horn Lake Middle. She utilizes a free teleconferencing program called Generation Global where her students help teach English to other same-age students around the world. The byproduct is that they become more proficient in English as well. Generation Global is an education program for 12-17 year olds providing worldwide learning and dialogue opportunities. The site gives students topic ideas for discussion, and sets up international discussion groups. “I love that videoconferencing allows our students right here in Mississippi to speak to students their same age in places like Egypt or India. In a safe environment reserved only for students, they are able to participate in discussions based on predetermined topics,” Morris said. Brittany Dominguez, Teacher Lindsey Morris and Kimberlyn Cruz. Brittany Dominguez and Kimberlyn Cruz are two of her Horn Lake Middle 7th grade students who have participated in the program and both said it is really fun to meet people around the world and talk about different subjects. 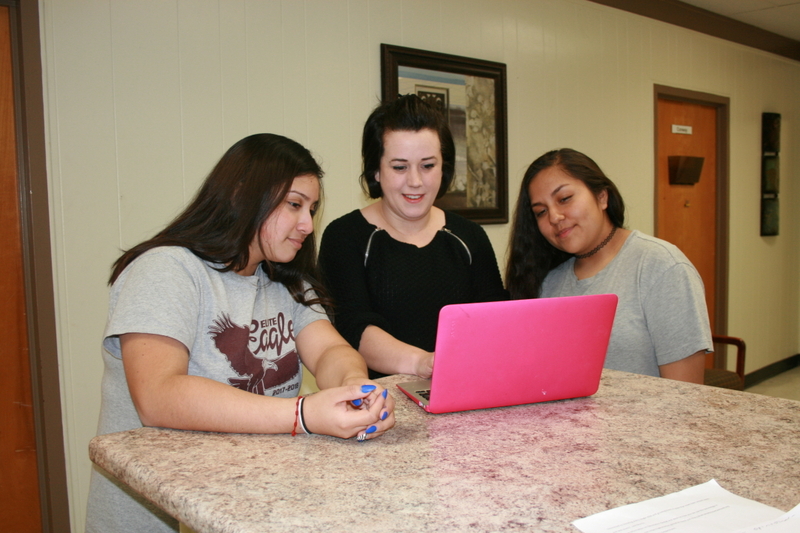 Teachers may find out more about the Generation Global technology program by visiting https://generation.global or http://dcsel.desotocountyschools.org. 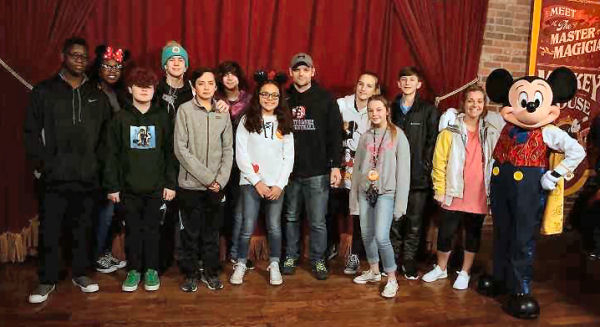 A group of students from Southaven Middle School had an unusual classroom experience in Orlando at Walt Disney World through the Disney Youth Education Series. In the fast moving world of technology and social media, it is crucial for young people to realize today's decisions can determine the course of their future. Students may not realize it, but they are marketing themselves in a positive or a negative way. Learning how to manage their personal brand in a intentional affirming approach gives young people the tools to navigate their lives now and into adulthood. 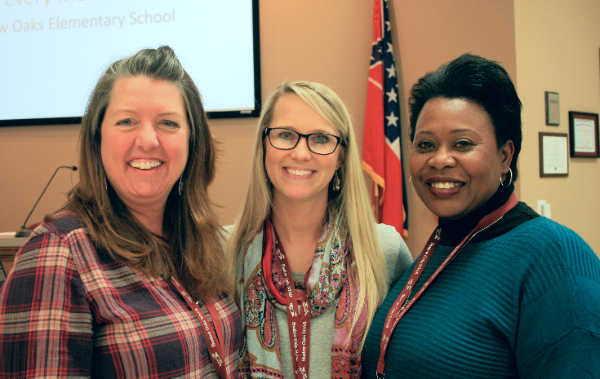 Shadow Oaks Elementary First Grade Teachers Tina Dearborn and Amber Beaver, and Principal Michaela Smith, gave a presentation to the DCS Board of Education. 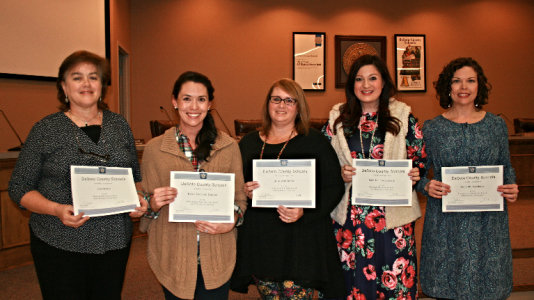 “Making Every Moment Count” was the focus of the presentation Shadow Oaks Elementary School teachers shared with the Board of Education. 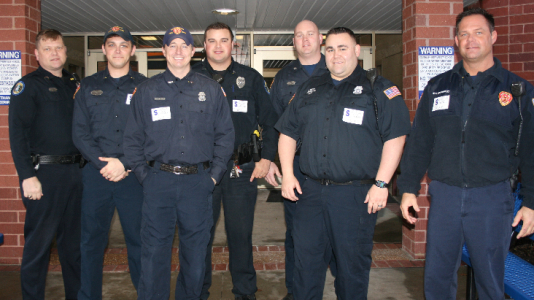 When students arrive, staff members on morning duty greet students and their parents with a positive attitude. Teachers stand at the doorway of their classrooms and make every student feel welcomed as they enter the classroom. “Even though you have papers to grade and lesson plans to set up, taking the few minutes to greet and focus on each child makes every child feel valued,” said First Grade Teacher Tina Dearborn. SIPPS is also an integral part of the SOES experience. Dearborn explained how the SIPPS (Systematic Instruction in Phoneme Awareness, Phonics, and Sight Words) Program gives teachers an opportunity to be a part of all students’ growth, and work with students individually. 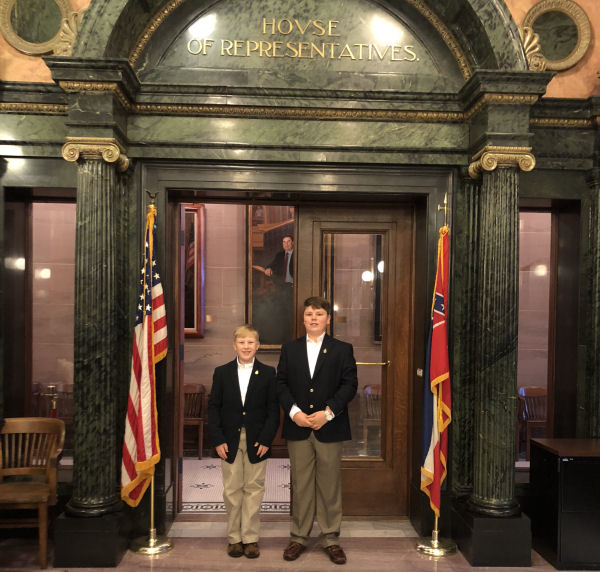 Hernando Middle School Students John Michael Powell, 7th grade, and Reid Russell, 8th grade, recently served as pages in the Mississippi House of Representatives in Jackson.